Consumed by guilt over the life her aunt Olga gave up to raise her, Natalia Gordeeva has devoted herself to pleasing the bitter, vengeful woman. She knows that God would have her honor her aunt - but to what extent? Tony Santerimo has known Natalia was "the one" since the day she walked into his pizzeria - and his heart. Natalia is somewhat receptive to Tony's attention, but he soon finds that fear and manipulation seem to paralyze her. If Natalia stops living for her aunt's elusive approval, will she lose the only identity she's ever known? Can the Lord show her who she is, and who she can be - for herself and for Tony? Fall in love with this inspiring love story and our entire collection of Christian romance novels from Heartsong Presents! 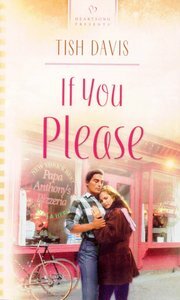 About "If You Please (Heartsong Series)"
Tish Davis lives in sunny Florida with her husband and three sons, whom she homeschools.